When you say USB stick you remember 2 to 3 inch device with a cap on it. Now its time to forget this conventional model and think about a small chip with a tag. Yes,Dutch promotional product manufacturer Deonet has announced World's smallest USB stick with 16GB capacity. There are many small USB sticks available in market. But, Donet claim dimension of this device as 19.5x14.5x2.9 mm which is the smallest among all. Coming to technology used in this smallest USB is UDP. UDP is abbreviated as "USB Disk Package" a assembly process, which includes the controller,flash IC,substrate and passive components molded into a very small compact package. 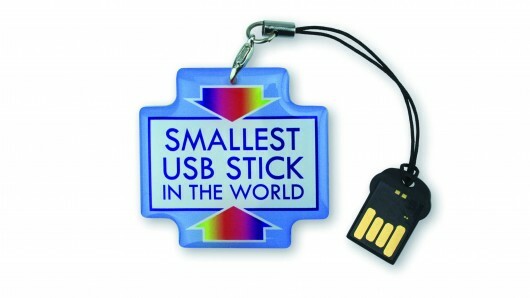 We agree with existing USB stick products in the World, this is the smallest . We still hope that there will be advanced and compact USB sticks with evolving technology in future. Total honour goes to Deonet for introducing such an amazing compact USB stick with new technology. You can also checkout various Deonet memory product in their official site.